Native New York Chef Bobby Flay is popularly known for his exciting TV presence, and for making his mark on the culinary scene with several restaurants. He has grown his kitchen talent into a brand that finds it’s way into many arenas of popular culture. His competitive but laid back demeanor belies a bubbling enthusiasm for food that is on display each time Flay cooks. Flay is a huge player in a food revolution that continues to bring better food into American homes. Riding the early wave of populist gourmet love, Bobby Flay stumbled onto a format the he and countless other celebrity chefs continue to exploit: Food Competitions. His early appearances on Iron Chef thrust a whole new sector of the American TV audience into a competitive food arena that was educational at once. Chef competitions are nothing new, they have occurred at a casual level for years, but an interest in high-stakes culinary battles has found a permanent place in our culture, with competitions popping up everywhere. Flay’s certain charisma makes him a crowd favorite when he’s turning up the heat in kitchen stadium, and he has parlayed his kitchen credibility into the role of judge on popular Food Network competitions like, The Next Food Network Star and The Next Iron Chef. Within the culinary world, Flay is well-known for his dynamic dishes that emphasize grilled everything, especially meats grilled with glazes, relishes and spicy sauces, all distinctly infused with the flavors and heat of the Southwest. Cajun and Southwestern cuisine bring the flagship flavors to the Flay brand, ever since Jonathan Waxmann indoctrinated Bobby into the subtle spiciness of the regional specialties. Judge, host, Iron Chef, author and restaurateur are all hats that Flay wears successfully, so however he comes into your life as a student, you should embrace his position in the industry and learn from his rise to fame. The Flay formula might be applied to your own education and career, in a way that enables you to mirror his success. 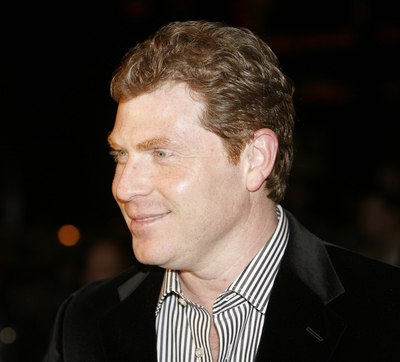 You might say that Bobby Flay’s passion for food was born during his obligatory time as a teenaged food service worker, but it could be a stretch to link his early ice cream parlor and pizza making jobs to the charismatic on-screen food authority we see today. Flay’s creative sandwich making skills, on display at a restaurant where his father was a partner, showed potential enough to push Flay toward The French Culinary Institute of America. Though he hadn’t completed high school, Flay earned Culinary Arts degree from the prestigious French cooking school in 1984. Flay worked his way through the ranks, while sharpening his culinary skills until 1991, when he had an opportunity to partner in what would become Mesa Grill, his first owner/operator venture. Mesa Grill on 5th Avenue in NYC is still his flagship restaurant and continues to bring the desert into the city. The menu features pan-seared renditions of beef, pork, fish and wild game with chilies, relishes, sauces, glazes and chutneys, and other signature preparations crusted with blue corn, cornmeal, and peppers then grilled with tomatillos, chilies and peppers. Flay’s brand has grown to include twelve restaurants that operate under names like Bar America, Bobby Flay Steak, and his latest venture: Bobby’s Burger Palace. The restaurants are heavily represented in East Coast locations like New York and New Jersey, but Mesa Grill branches can be found in Las Vegas and Bahamas as well. Flay’s first food TV show was his very successful Food Network program, Hot Off the Grill with Bobby Flay, which solidly secured him a place as a rising food star and cemented his status as upscale grill master. Flay hosted a few other grill-related shows for the network before really stepping into his stride with shows like Boy Meets Grill, BBQ With Bobby Flay and his most notorious brand-builder: Throwdown! With Bobby Flay. On Throwdown!, Flay turns again to the competitive food format ala Iron Chef. He pits himself against the masters of particular regional dishes and tries to one-up their signature recipes. A tongue-in-cheek, self-deprecating air permeates the show, where Flay is a frequent loser. The diverse Flay has also carved out a role for himself as a judge on other popular Food Network shows like Next Iron Chef and The Next Food Network Star. He brings a sensibility to the role of judge by "telling it like it is" to groups of emerging professionals eager to soak-up his targeted critiques. His talents have landed Flay stints on other networks outside the foodie culture of the Food Network. His show Main Ingredient was carried by Lifetime Television in the 90’s, and Flay currently appears twice monthly as a guest chef on the CBS Early Show. The Flay franchise also includes a string of cookbooks that perfectly illustrate his food point of view. As well as being a Southwest grillmaster, his recipes show his passion for Cajun and Creole cuisine. Some books are aligned with his TV shows, and feature recipes that viewers see on TV. He also markets a few food products, including a line of Mesa Grill rubs, hot sauces and barbecue sauces, and his signature Bobby Flay steak sauces. As a guest instructor at his alma mater, The French Culinary Institute, he inspires students with an upbeat but forthright analysis of what it takes to succeed. As a nod to his own success, Flay launched the Bobby Flay Scholarship that provides a full ride each year to a hand selected member of the Long Island Culinary Arts Program.